On September 23, the Dominican Republic Constitutional Court made an interpretative ruling that shook the Hispaniola Island. A child born on Dominican soil without one parent of Dominican blood or foreign parents with legal residency is not a Dominican citizen. In 2004, the court held that “in transit” includes all persons without legal residency. Thus, parents considered “in transit” or illegal immigrants are not Dominican citizens, and the children born from these parents, dating back to 1929, cannot have Dominican citizenship. 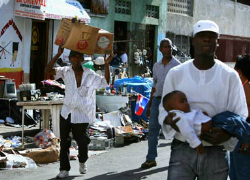 The ruling effects all immigrants in the Dominican Republic, not just Haitians. However, at least eighty percent of Dominican immigrants are Haitian. It is no secret that Haitians are the predominate immigrants in the Dominican, which leads many spectators to believe the Dominican court targeted Haitians: a flashback to 1937, when Dictator Rafael Trujillo attempted to eliminate Haitians from the Dominican. Several reporters cite over 200,000 Haitians are stateless due to the ruling. Conversely, based on the numbers provided by the United States Dominican Embassy via the national civil registry, less than 20,000 Haitians are effected by the ruling; furthermore, they will not be stateless. A person is only stateless if no country will recognize and grant citizenship. Haiti’s constitution has been interpreted to grant citizenship to those of Haitian blood regardless of where the person was born. Thus, Haitian immigrants will not be stateless. Even though the ruling cannot be appealed, the Dominican government plans to establish a naturalization law. Moreover, Dominican President Danilo Medina announced a humanitarian approach will be applied, allowing eighteen months for all undocumented foreigners to register and prove eligibility for residency to avoid deportation. Was the Dominican court wrong in its Constitutional ruling? Perhaps the ruling was more extreme than necessary, but a step to control immigration is necessary. Rarely is birth on any country’s soil alone enough to gain citizenship. The Dominican is no different. If an immigrant does not speak Spanish, work, own property or a home, the Dominican is less likely to grant citizenship to the immigrant. Citizenship is business. No business wants to employ or have clients that do not benefit the business. When a country has a say, the country wants the immigrants that benefit the country. A country, small like the Dominican, cannot progress if illegal immigrants that do not contribute to the economy are allowed citizenship. Is it right to ostracize a third-world country for a ruling, which if ruled by a leading country, would receive little backlash? Perhaps, this is how the world’s checks and balances function: never let a lower country make a move reserved for higher countries. Due to the inaccuracies in information and range of predictions, it is clear that the Dominican government needs to release a statement—to explain the court’s ruling and its effects. More likely than not the government is at a loss itself and cannot offer clarity. However, this is a time for the government to stand strong and make executive decisions. Is the ruling stripping immigrants of citizenship, if the immigrant was granted citizenship prior to the ruling? Is the ruling only effecting those who are not and have never been citizens—regardless of the individuals assumed citizenship? What actions can an immigrant take to gain citizenship or avoid deportation? Will a naturalization law be implemented before deportation occurs? The Dominican government cannot afford to remain silent much longer, it needs to stand up. Cheyenne Moore is a 1L at the University of Denver and a Staff Editor on the Denver Journal of International Law and Policy.